Here is another lovely recipe I was emailed by Marie (from Traits). I really enjoyed them as burger patties even though I’m a little uncomfortable with the taste of ginger. It won’t replace my standard comfort burger but it will be a nice change when I feel like going a little more gourmet. I’ve included Marie’s email text below as I love the way she writes. If you have recipes for me to try email them to me at Kim@WhatKimAte.co.nz. 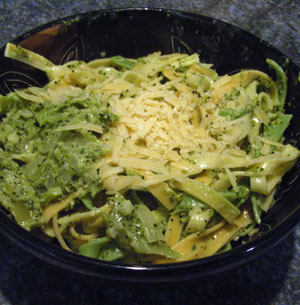 “Here is a recipe from Allyson Grofton (food in a minute lady). Peel & cook pumpkin in a little boiling water, drain and then put back into pan to dry it out – a couple of minutes, just to its not too wet. In a processor (I don’t have one so I used a potato masher) cannellini beans, garlic, ginger, chilli and 1/2 breadcrumbs. 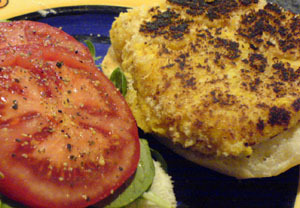 Mould into 12 patties (or burger sized patties) and roll in remaining breadcrumbs. Fry with a little oil until golden and heated through, keep warm while others are being cooked. Serve as it or with a plain salad or make mega burgers! Andrew loves this and I’m looking forward to getting out the barbie and making these bad boys in summer. Keep up the great blog! Accidentally made your dish too salty? too spicy? You haven’t burnt it have you? Today as I was salting my Red Wine and Garlic Lentil soup the lid came off the salt container and way too much salt poured in. How do you reduce the saltiness? I only had vague ideas but I knew the internet would save me. I found a wonderful article by Peter Martin called When Things Go Wrong: A Guide to Fixing Kitchen Disasters. Bookmark it and remove the guesswork from fixing cooking disasters. The Joy of Travel: Treasure 2 – Orchards. I love going into the road side fruit and veggie places. I remember the first time I had an apricot from an orchard, it was so warm, fresh and tasty. Prior to that experience I actually thought I didn’t like apricots. 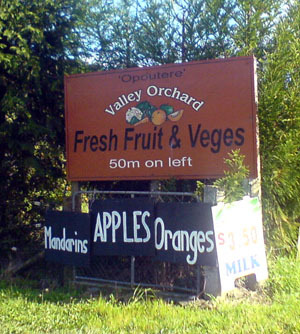 The other bonus in going to orchards is that there is often something different to try. 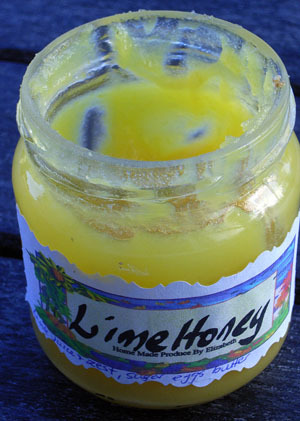 On our visit to the Opoutere Valley Orchard we found an excellent Lime Honey homemade by Elizabeth. It’s a little more zingy than a traditional lemon honey, it certainly makes my taste buds wake up and take notice. Glorious. Edit: It turned out well, although not well enough to bother with again when there are so many wonderful cake recipes out there. What was really nice was the ginger and lemon icing! Thomas and I are now living in Auckland. We have a new kitchen which is small but well set up. I’m not sure why I decided to experiment with the first cake I’ve made in the new oven, especially as it’s Thomas’s birthday cake. Failure or success, place your bets ladies and gentlemen. I’ll report back later either way. The good news is that I’m home all day today so I can make a back up cake as well. The Joy of Travel: Treasure 1 – The Chilli Patch. One of the things I really like about travel is trying new food, taking the best that a cuisine has to offer and integrating it into my own cooking repertoire. While travelling overseas it’s easy to find and try new foods, new and different is everywhere. While travelling in NZ it’s a little harder, the familiar is everywhere but I have found a few little treasures. 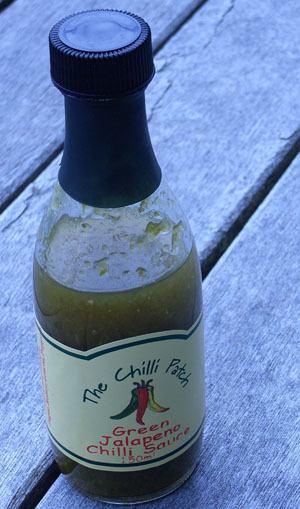 The first I want to share is Green Jalapeno Chilli Sauce from the Chilli Patch/Penray Gardens (South of Otaki on State Highway One). This is a medium intensity chilli with a sharp bite with a delicious and complex flavour. At the moment I’m a bit obsessed with it and I’m trying it with everything (well, everything savoury at least!). My recommendation: Try it on the side with a frittata, the sharpness really livens it up. The best thing about finding food in your own country is that it’s easier to go back and get more. Next time I’m buying at least four bottles (they’re only $4.50 each). Nice. Ying, a lovely woman that I work with (from China) often drinks a dark liquid drink in the mornings at work. We played a guessing game as to what it was. I suggested Mushroom soup. 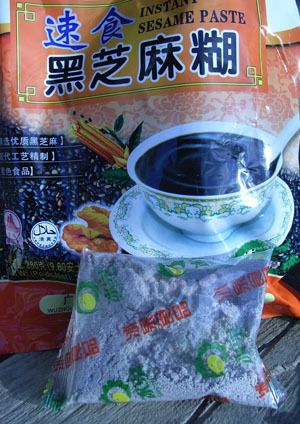 It was a traditional Chinese breakfast drink made up of black sesame, black rice, walnut and sugar. She brought a packet into work for me. I tried it as instructed (stirred in boiling water) it was nice although slightly too sweet for me. Being from the land of dairy I tried it again the next day for breakfast with milk instead. I also used only half the amount of recommended sesame seed paste. 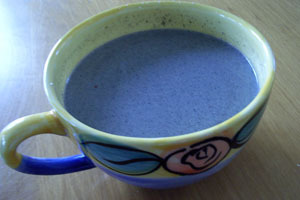 It was really sweet, rich and satisfying, the kind of drink I’d love to have on a cold night just before bed. It’s marketed as a health drink although I’m not convinced as sugar is the largest ingredient. On the plus side one serving contains 16% of your recommended daily intake of iron. 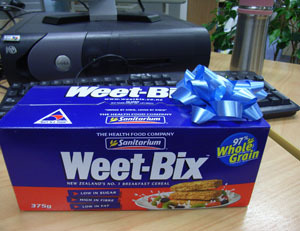 During the discussion at work about breakfast cereals we found out that Ying had never tried Weet Bix. I left this on her desk (with instructions! ).